"To Map or Not To Map, That Is The Question"
If buildings along a channel are subject to frequent flooding but there is no regulatory mapping, is it really a 'flood risk zone'? Risks are sometimes equated to the presence of regulatory mapping that defines risk. But risks exist whether you map and manage them or not. This post explores the "Where?" and the "How?" 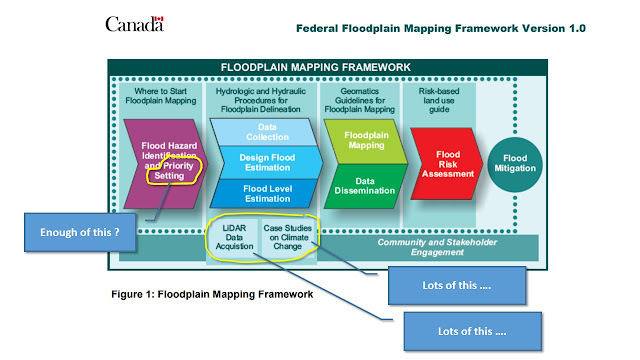 of floodplain mapping to best define risks. First some background - regulatory mapping, such as under Ontario's Conservation Authorities Act regulations, delineates risk areas where it has been decided to map risks. It is a choice - to map or not to map. Regulation and risk are therefore quite different, as risk can extend upstream of the last flood plain mapping sheet, extending further up the river system, or even up through the urban landscape and infrastructure systems. Obviously, our goal in terms of risk management and urban flood damage mitigation would be to map all the important risks - those contributing to frequent or extensive damages - and to then develop a strategy to address those risks. While Ontario is quite advanced in terms of the identification and management of river flood risks, there are opportunities for improvement where risks on smaller urban watercourses are defined. Traditionally, a catchment size limit of half a square mile, or about 125 hectares, was used to define rivers reaches where hydrologic and hydraulic modelling would be completed to delineate the extent of the regulatory flood plain. Reaches for smaller reaches were not typically mapped. In new development areas, a smaller threshold is often applied during land use planning and development servicing studies which ensures that local risk are managed. However in historical development areas, it is not uncommon that some river reaches with catchment sizes of several hundred hectares are not mapped, meaning that risks in small flashy systems (those that respond to high intensity rainfall convective summer storms) are not identified, regulated, or mitigated. The following figure summarizes the framework steps. How about an example showing why "Where to Map?" is more important than "How to Map?". The Don Mills Channel is a small urban drainage channel, with a historically realigned watercourse called Cummer Creek in the Don River Watershed. Floodplan mapping has been pursued since the 1960's in Ontario and a great summary of floodplain mapping history is available here: The State of Floodplain Mapping in Ontario Presented to the Institute for Catastrophic Loss Reduction, June 15, 2007, Don Pearson, General Manager, Conservation Ontario. While the watercourse is an area of focus for flood control, regulatory floodplain mapping was completed for the channel only in 2011. Prior to that, estimation mapping was completed (by this post's author) to support generic regulation updates in 2006. 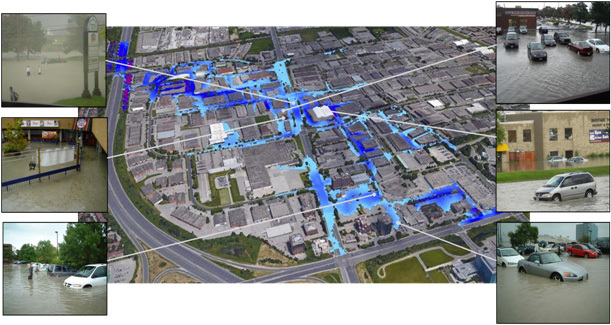 So how has the characterization of risks changed with this 'new' mapping of the Don Mills Channel?The following figures illustrate how building flood risks in the newly mapped Don Mills Channel compare with city-wide Markham building flood risks identified as part of its Flood Emergency Response Plan. Extending floodplain mapping a one tributary can dramatically change the characterization of overall riverine flood risk for the 100-year flood event. Riverine flood risks defined by depth of flooding at building structures changes significantly with the extension of floodplan mapping to previously unmapped watercourse reaches. Frequent flooding during low return period events increases significantly with the extension of floodplan mapping to the Don Mills Channel, a tributary of the Don River also called Cummer Creek. The charts above clearly show that the accounting of at-risk buildings within the extension of regulatory floodplain mapping in a single tributary dramatically changes the characterization of city-wide risks. For example, the number of high flood depth structures (depth greater than 0.6 metres) during a 100 year event in the new reach is more than double the entire previous city-wide number. For frequent flood events like the 10 year storm in the last chart, the number of high-depth structures increases by 10 times or more - these new, frequent, high-depth structures can be expected to represent a high proportion of average annual flood damages. While development occurred in the Don Mills Channel area in the 1960's (channelization and realignment was in fact to support development at the time according to the original 1966 design report), floodplain mapping was not initiated until 40 years later with the generic regulation update estimation mapping (i.e., HEC GeoRAS considering only overland components and not culvert enclosures - see this post for our perspective on riverine flood vulnerability methods). Advanced mapping to support regulation was completed later in 2011. 3) even more advanced 2-dimensional PCSWMM integrated with the municipal storm pipe network (2018 Class EA)? .. or refining the digital elevation model using LiDAR to get those flood depths to millimetre accuracy around every metre of he perimeter of each building, instead of typical mapping? Or is the most important question in defining risk the "Where?" Yes, "Where?" is the important part and the other considerations of "How?" are secondary or tertiary at best. Nobel laureate Daniel Kahneman, author of Thinking Fast and Slow, referred to WYSIATI, an acronym for "What You See Is All There Is", which is a way of saying that we often miss things by acknowledging only the things we know (the known knowns) while being oblivious to the unknown unknowns. We recognize only what we see - or what we map and acknowledge. In the case of flood plain mapping, the risks we map are often considered to be all there is, since that is all that is being regulated or managed. Obviously then, "Where?" and "If" we map riverine flood risks can be of critical importance. And although our technical methods for delineating flood risks must be carefully considered, "How?" we define risks is relatively less important.